It looks like something was in the works after all. Despite the Sharks’ objections to the SEIR’s findings and recommendations, they and the City of San Jose agreed on a future location for parking and possible office space (SJ Business Journal, SJ Mercury News). The terms of the agreement are outlined in pages 68-90 of the June 15 City Council info packet. The section is called “THIRD AMENDMENT TO THE AMENDED & RESTATED SAN JOSE ARENA MANAGEMENT AGREEMENT.” Interestingly, the text of the document points out that because the new parking garage would be an amendment to an existing agreement, the garage would not be considered a new project, and (my interpretation) thus would not require its own separate, new EIR. The land for the garage is immediately north of HP Pavilion, on currently zoned industrial parcels housing the decades-old Milligan News educational books facility, a foundry, and two houses on N Montgomery St. Like the ballpark parcels, the garage parcels would be subject to negotiation between the current owners and the City, though the City could invoke eminent domain (yikes). San Jose Arena Management (Sharks/SVSE) would be ultimately responsible for the land acquisition and development costs. SJAM would also take in all revenues associated with operating the garage. The City would reciprocate by funding the completion of Autumn Parkway – with what funds is yet to be determined. The key here is that the location is not particularly ideal for either the ballpark or the train station, as it’s over 1/3 mile away from either site (Area E above). A connector bridge over Montgomery Street would connect the new garage to the existing elevated parking lot, and a separate vehicle entrance/exit from the planned Autumn Parkway would be the way to get there.While the location isn’t terribly convenient for train/ballpark users, it does solve the issue of maintaining existing parking while a new garage is built. As a result of this deal, both of the published garage options in the existing EIR are now out of the running, though it’s possible and/or likely that they could be revisited as parking demands rise in the future. What does this mean for the A’s? 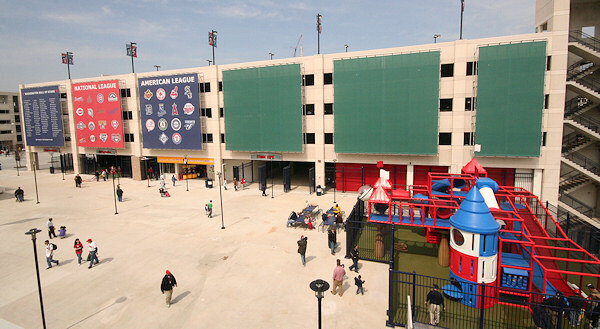 For now, it means there’s one less obstacle and 1,000+ spaces of additional parking in the area when a ballpark opens, though again it won’t be the most convenient location. In fact, some lots on the other side of CA-87 will be closer. I think we’re moving closer to the notion that the A’s will look to build their own parking garage on the ballpark site, also with 1,000 spaces give or take. The Nats already know what this looks like. This entry was posted in Hockey, News, Politics, San Jose. Bookmark the permalink. My take on all this. I believe the Sharks want to insure that they will have plenty of parking while things are being built. For example if a garage is built at A next to the HP Pavilion, they would lose a large number of spots. The could now build the garage at E first and then start at A. They could make the parking garage at A for High Speed Rail, Caltrain, BART, and the A’s stadium parking garage while E would be strictly for HP Pavilion. In that way the Sharks gets all of the revenue from parking garage E and would split the revenue for the garage built at A with the city of San Jose while requiring the city of San Jose to pay for the garage at A entirely since there might not be any use for the HP Pavilion. Long term all the lots south of Santa Clara will be developed so all of that parking will go away. The building of the A’s stadium will likely speed up the development of some of those lots. Also the building of BART will probably close off a large part of those lots nearest to HP Pavilion south of Santa Clara. If the A’s stadium is approve, parking garage at E would start first. After E is finished, they would still have time to build and complete parking garage A before the A’s stadium is complete. 1/3 of a mile is nothing. How far is it from BART to the Coli over the BART bridge? How far from BART to Oracle Arena? Has to be at least 1/3 of a mile. Considering that eventually the area between the ballpark and HP/future garage will be built up with retail and restaurants, the “1/3 mile” shouldn’t be anything like trecking across the BART bridge. More akin to a stroll down Yawkey Way if you ask me! I’ve said this before and I’ll say it again, if you cant walk from your car to the stadium and you’re not a senior citizen or a child, you don’t need to see a baseball game. You need to see a doctor. When I go to Sharks games or any events at the arena I always park on San Carlos…not because I have to but because I want to. This is just a bit further walk than what is talked about if the ballpark is built and your coming from the new parking garage but personally, I much prefer walking a bit and than having an easier exit from the area than being caught in traffic around the Tank. Because of the distributed parking throughout the downtown core traffic empties pretty darn quick after an event and would expect the same thing if the ballpark is built. According to my low-tech calculations (google maps and a ruler), it looks to be about 1000 feet friom Gates LL and MM to the BART station and another 500 feet to the middle of the BART lot. Add another 1700 feet to either of those to get to the front door of the arena (the entrance by the ticket window). @GoA’s – Your last paragraph hit the nail on the head. A close proximity garage will be needed for VIP’s, players/personnel, etc. @Brian – Use the Google Earth app’s ruler feature. You can trace paths. It’s quite good. OK, I got .21 from LL of the Coliseum to the station, .48 from the front door of the arena to the station, and an extra .11 if you go to the middle of the BART parking lot. So my 1000 should’ve been 1109, my 500 was 581, and 1700 was 1426, so I guess my technique was passable at best. How about no parking garages? There’s too much parking in the area already. They’re ugly and take up land that could be used for better things. If a parking garage must be built, this is the location for it and there shouldn’t be a parking garage near the stadium. There’s not much land near the train station, and it should be reserved for extremely high density mixed use office and or residential since it will sit on the largest transit hub in the bay area. JMullen, How much parking is in the area? 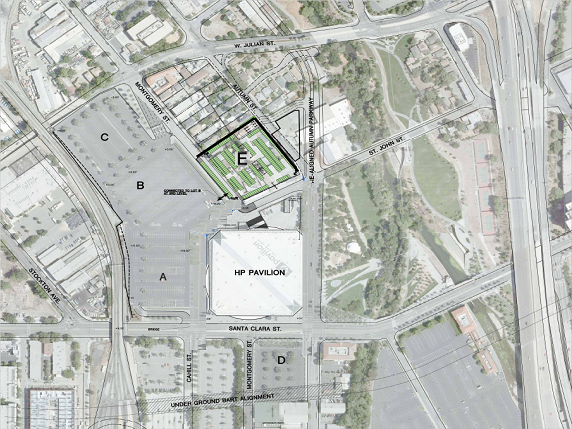 Do you have a count of the number of spaces within a half mile of either the Arena or the proposed stadium location? Obviously the Sharks disagree with you, or they wouldn’t have submitted the papers regarding the EIR. Much of the surface parking in the area is slated for development in the future; Adobe expansion, mixed-use development of Diridon Station, etc. In conjunction with the proposed Sharks parking garage, I could see a smaller garage incorporated into the actual ballpark design for VIP’s and players/personnel; perhaps in the area near Park Avenue and the future HSR line.